It's always a difficult call, making movies about the greatest atrocity in the history of mankind, namely the Shoah (Holocaust). After all, it can be argued, what right do we have, as mere spectators, to be 'entertained' by the recounting of events that, quite simply, cast doubt on the very existence of the God worshipped by the Jewish community, including the six million who were slaughtered in Hitler's Final Solution? It is a fair question, and probably why recent previous efforts (such as Spielberg's Schindler's List (1993), or The Pianist (2002) by Roman Polanski) have had their adulators and detractors. 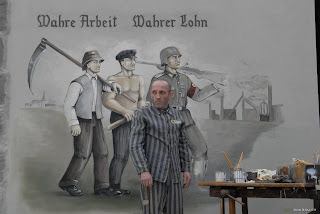 In his written and directed adaptation of the book by concentration-camp inmate Adolf Burger, Stefan Ruzowitzky (All The Queen's Men (2001)) chooses to contrast the relative banality of a counterfeiting operation (albeit the largest such scam in history, set up by the Nazis in 1936, both as a source of funds and later with the intention of swamping enemy countries' economies with fake currency) with the horrors of the camps. Central to the story is Salomon 'Sally' Sorowitsch (Karl Markovics), allegedley the world's greatest forger, whose luck runs out and who is arrested by Friedrich Herzog (Devid Striesow). A relatively humane man of the law, Herzog is promoted thanks to his catch, and becomes Sturmbannführer Herzog, charged with the counterfeiting operation. After surviving far worse conditions as a prisoner by the skin of his teeth, Sorowitsch is summoned to oversee the scheme, with the team involved treated to far better conditions than their camp counterparts, the screams of whom permeate the forgers' daily lives. And so the film's point becomes clear - how long can Sorowitsch turn off his conscience, faced with the knowledge of what the Nazis are doing and the righteous rage of Adolf Burger (August Diehl), a young reactionary for whom death with honour is better than life as it is? The Counterfeiters won the Best Foreign Film Academy Award in 2008 and, for the most part, it's a worthy winner. Markovics's lead performance gives the film real heart and the horror of his daily life, while not graphically depicted, hangs over the mood like a pall. However, it is Striesow as the camp's commandant that is the best of the film - a fascinating, nuanced analysis of how the evil that a man can do is not necessarily all that a man is. It's a fascinating, troubling work - only its somewhat pat conclusion, which leaves the viewer as much in the dark as at the film's outset, lets it down a touch. 98 mins. In German, Russian, English, Hebrew.